Most CEOs don’t clean bathrooms, report to entry-level employees, or stop by stores just to chat with customers. Then again, Larry Sutton isn’t most CEOs. 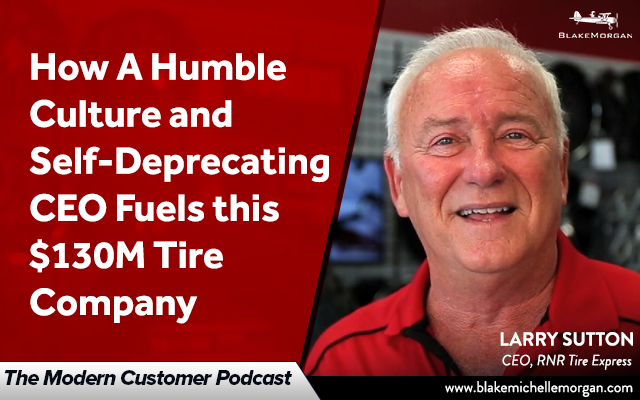 Larry has turned RNR Tire Express into the fastest-growing tire franchise in the country with a humble and self-deprecating attitude. Larry doesn’t see himself as the head of the company; in fact, he’s actually turned the entire structure upside down. RNR uses an inverted version of the traditional pyramid hierarchy system. Larry reports to other executives, who report to regional managers, who then report to store managers and employees. As Larry says, the people who are doing the actual work are often the ones who have the best answers; if he wants to find out what kind of trucks to buy, he’s going to ask the manager who works with trucks all day instead of an executive who is removed from the actual work. It’s all in an effort to create a serve spirit instead of a service spirit. The CEO reports to everyone else because it is his job to serve them. That culture trickles down to customers, who can see a difference. A serving attitude permeates RNR in how employees are treated. Larry believes that employees won’t be willing to serve customers fully until they are served and valued. That comes from working with them as a person instead of just an employee. Managers and executives help employees develop life skills so they can be the best husbands, wives, fathers, sons, neighbors, etc. they can be. RNR is a company full of changed lives in the business of changing lives. Focusing on employees and changing their lives spreads to customers and helps the company change their lives, as well. Larry follows the Yes CEO mentality and has a goal to say yes more often than he says no. When an employee or franchise owner has an idea for something new, Larry almost always lets them try it, even if he doesn’t think it will work. The idea will either be a great success or serve as a learning experience for the employee and teach them more than if Larry had just shot the idea down in the first place. As long as it doesn’t hurt the brand, employees are free to try a lot of different things to create unique solutions to help customers. Serving is at the heart of everything RNR Tire Express does. The goal is not to provide service, but to serve people. Multiple times a year RNR hosts events for employees and their families to connect and share the culture of the company. It costs a lot of money to put on events and offer rewards, but Larry believes it is worth it to serve employees. In an effort to build the culture of service, Larry has even turned down potential franchises who just didn’t fit the RNR culture. Another way Larry stands out from the typical CEO is that he doesn’t take himself too seriously. He knows his employees and can connect with them on a personal and self-deprecating level. When he stops by the stores, he often checks to see if the bathrooms are clean. If they aren’t, he quietly grabs a mop and gets to work. Larry also isn’t afraid to get feedback. It all comes back to the attitude of humility. He realizes that getting tires isn’t a pleasant experience for most people, so he welcomes new ideas of how to improve the experience. As Larry visits RNR franchises, he talks to customers in the waiting rooms about what could make their experiences better. When one customer suggested free Uber rides, four franchises started testing the idea. Other franchises are trying free pickup and delivery and mobile tire installation, and all franchises offer free refreshments and charging stations. Larry truly believes that investing in customer experience pays off by creating an environment where people want to work and customers want to do business. His unique approach is working—RNR Tire Express has grown to a $130 million business since it started franchising in 2003. Thinking outside the box and serving with humility can make a big difference for companies across all industries, and it starts at the top.